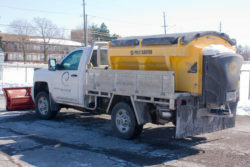 Envision Landscapes offers salting and de-icing as part of winter maintenance. This clears the property of all potential ice and snow hazards. 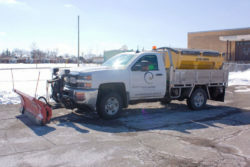 We use a combination of bulk salt or alternative de-icers to clear and melt the snow. These services are usually in conjunction with the snow clearing services offered by Envision Landscapes. Often, these services are seen as insurance for your business. In today’s legal climate, it is a liability to have ice and snow on your parking lot, as it increases the chances of a slip and fall. As landscape contractors, we carry liability insurance against such an event; however, if a slip and fall were to happen the lot owner is also affected. Let’s be pro-active and work together to minimize winter hazards for your clients, customers and yourself. Whether your property requires bulk salting or alternative deicer, feel free to contact us for a quote today. The customer service was what sold us on Envision Landscapes. Both Matt & Dave were there to answer any questions we had, and guide us with the dream that my wife had “Envisioned” for our backyard project. As there are a few landscapers out there, we did some research yet kept hearing from others the name Envision so called them, and upon meeting Matt knew we had found our backyard partner. Not only did they come in under budget, but they completed on time. These guys go above and beyond… which is why our next door neighbors are now using them 🙂 Thanks to all the crew at Envision Landscapes, we are truly proud of your work that we are sharing with our friends, and give you credit for it each time someone asks.